How are you at growing indoor plants? Is your thumb more brown than green? Never fear! 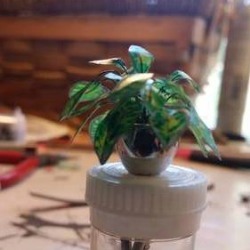 Craftylittlemonkey has the solutions to your plant woes. Her tutorial for a Mini Indoor Plant is not only over the top cute, but it also allows you to enjoy greenery without all the hassle. This little guy is perfect for doll houses and fairy gardens. You can make several for your office desk or as little accents around your home. Once you have the technique down, you can create a wide variety of plants from a ficus to a fern. From one inch to one hundred feet; we have fun tutorials in every size. Check out our Tutorial Cloud and create something special for your beautiful world.